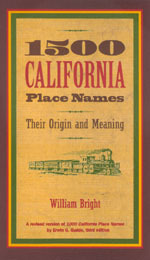 This is the new "pocket" version of the classic California Place Names, first published by California in 1949. Erwin G. Gudde's monumental work, which went through several editions during its author's lifetime, has now been released in an expanded and updated edition by William Bright. The abridged version, originally called 1000 California Place Names, has grown to a dynamic 1500 California Place Names in Bright's hands. Those who have used and enjoyed 1000 California Place Names through the decades will be glad to know that 1500 California Place Names is not only bigger but better. This handbook focuses on two sorts of names: those that are well-known as destinations or geographical features of the state, such as La Jolla, Tahoe, and Alcatraz, and those that demand attention because of their problematic origins, whether Spanish like Bodega and Chamisal or Native American like Aguanga and Siskiyou. Names of the major Indian tribes of California are included, since some of them have been directly adapted as place names and others have been the source of a variety of names. Bright incorporates his own recent research and that of other linguists and local historians, giving us a much deeper appreciation of the tangled ancestry many California names embody. Featuring phonetic pronunciations for all the Golden State's tongue-twisting names, this is in effect a brand new book, indispensable to California residents and visitors alike. William Bright is Professor Adjoint in Linguistics at the University of Colorado, Boulder, and author of numerous books including A Coyote Reader (California, 1993). He edited the four-volume International Encyclopedia of Linguistics (1991), as well as the revised, unabridged California Place Names (California, 1998).